A floor plan is an overhead view of the completed house. You'll see parallel lines that scale at whatever width the walls are required to be. Dimensions are usually drawn between the walls to specify room sizes and wall lengths. Floor plans will also indicate rooms, all the doors and windows and any built-in elements, such as plumbing fixtures and cabinets, water heaters and furnaces, etc. Floor plans will include notes to specify finishes, construction methods, or symbols for electrical items. A section cuts through the dwelling and the location of this 'cut through' is noted on the floor plan. It describes how the building will be constructed and discusses how the internal finishes are to look. Sections are used because they explain certain conditions in more detail. These conditions may include ceiling height, ceiling type (flat or vault), and window and door dimensions. Framing plan, for wall, including the size of the lumber to be used - usually 2x4 or 2x6. Dimension lines, which consist of a solid line with a mark at either end; space between the two marks equals the distance noted next to the line. Wall : one uses thick solid lines for walls. Partial height wall, low wall that doesn't go all the way to the ceiling. Thin solid lines are used for built-in structures (such as cabinets, bookshelves, or plumbing fixtures). Thin dotted lines indicate overhead features, such as wall cabinets in a kitchen or a special ceiling treatment or an archway in the living room. An open floorplan is one which values wide, unenclosed spaces. They are made possible by curtain wall technology, engineered lumber and truss systems, and thoughtful structural design which allow for larger clear-spans than formerly possible in residential construction. An open floor plan limits or excludes walls separating the main living areas of the house (living room, dining room, kitchen) to allow for entertaining or interaction between family. 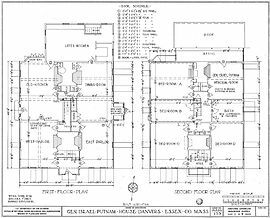 Wikimedia Commons has media related to Floor plans of houses.